Non-invasive, non-toxic, and patented technology that’s far effective than any vaccines, antibiotics and psychiatric drugs in the market. Good for all “incurable” diseases. No technical/medical skills required. 90-day Full Moneyback Guarantee. FREE: Premium Shipping, digital multimeter, high capacity Powerbank, and non-expirable User Support. This Virutron® Pro CM5206/25 unit is a professional full spectrum antiviral device with exclusive NeuroSweep® cranial-electrostimulation features. The two functions can be invoked on demand, which effectively negates the need for biochemical vaccines, chemical antibiotics, and psychiatric drugs, for the entire household. When all parasites are eliminated, more than 2,000 neuropeptide types are regenerated, among them is interferon and interleukin, which interfere with the growth of cancer cells and restore the full functionality of the immune system. When the ability of the brain to regenerate its own endorphins is returned through cranial electrostimulation, it won’t need any external source of psychoactive drugs anymore, and drug addiction is fully eliminated in time. 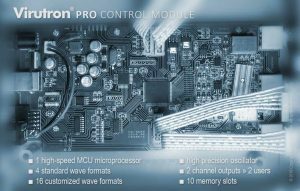 Inside the Virutron® Pro is a CM5206/25 control motherboard with a high precision, high performance, large scale FPGA integrated circuit that provides 200 million samples per second resolution, which makes every wave cycle as distortion free as possible. 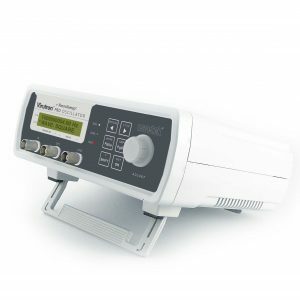 The device provides the user with the widest latitude for treatment and comfort through its variable output intensity, variable frequency, 20 memory slots for user-specific settings, and 20 standard + customized waveforms. *If we can electrocute all types of viruses in our bloodstream anytime, anywhere, for what do we need vaccines for? With this device and adequate amount of water intake, your body can get rid of cancer among many other ailments that you may be suffering from, and may never suffer from any viral infections in your lifetime again. However, all of these defensive and healing mechanisms need ample supply of energy, water and have their own limits, too. When these limits are breached, diseases start to manifest. The importance of water intake cannot be overemphasized, i.e. at least 90% of the body is water. There is no such thing as spontaneous cellular deterioration. Every cellular malfunction (cancer cell) and death is either caused by parasitic infection, loss of oxygen, inadequate nutrients, physical abuse, and chemical intoxication. Eliminating these root causes is enough to eliminate “incurable” diseases, including cancer and autoimmune system disorders, that you may be experiencing right now. Taking in toxic chemicals for every affliction only masks the symptoms, but aggravate the underlying conditions in the long term. A non-chemical protocol is necessary to ensure a decisive treatment that eliminates all parasitic infections and drug addiction without long-term side-effects. If you think that there are other root causes to any diseases other than those listed on the table, please inform us so we can formulate a better countermeasure. Otherwise, it is easy to see that you can always do something for some of the root causes listed above. The rest of the job can all be done with the full spectrum antiviral/antimicrobial Virutron Pro + NeuroSweep CES/tDCS in One device. Simplified schematic diagram of electrifying all types of viruses and parasites in the bloodstream. Conventionally, symptoms like high blood pressure, cough and colds, headaches, etc. are usually treated as a disease, and will keep on recurring time and again because the root causes haven’t been fully eliminated. Yet, these symptoms won’t return when all of the parasites are neutralized through the Virutron treatment. To illustrate, there’s no need for the blood to increase its flow rate by increasing its pressure just so it could deliver the much needed nutrients and oxygen in time, when damaged cells are already reduced, or prevented, by the effective electrocution of the parasites. In short, you can expect that you won’t be experiencing hypertension ever again after a few weeks of Virutron® antiviral / antimicrobial treatment and onwards. Remember, the full restoration of your immune system through the full elimination of the parasites in the bloodstream is the key to getting rid of any known and unknown ailments you might have, including cancer and AIDS. There’s only one way you can do that safely and decisively. 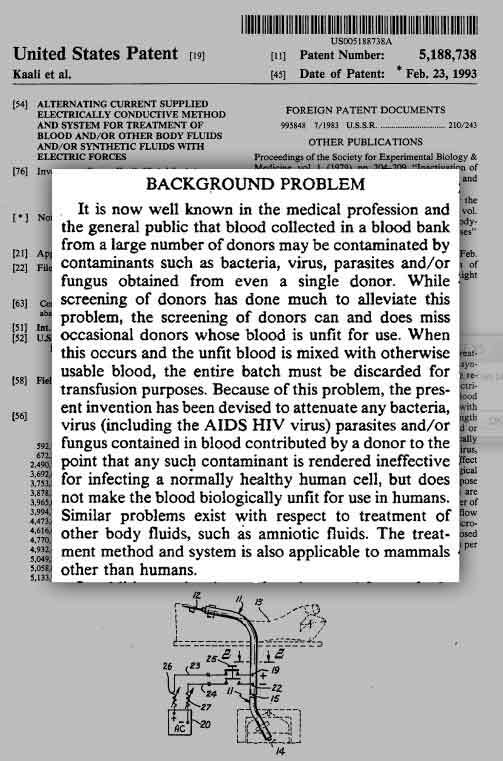 The non-invasive, full spectrum antiviral treatment technology itself is based on the shelved US Patent 5188738 issued on the research and method formulated by Dr. Steven Kaali, et al, which is proven to neutralize all known and unknown parasites, fungus, microbes, and viruses (including HIV-AIDS virus), but does not render the healthy blood cells unfit for the human body. When all parasites are eliminated, more than 2,000 neuropeptides are regenerated, among them is interferon and interleukin, which interfere with the growth of cancer cells and restore the full functionality of the immune system. There are hundreds of similar patents that are not being implemented due to their disruptive nature. With our non-invasive Virutron Pro + NeuroSweep CES/tDCS in One device, you now have a real choice between healthcare freedom at the comfort and privacy of your own home, or the preservation of expensive, toxic, invasive, and radioactive modalities. Once the immune system is fully restored, it can start to rid the organs of their viral and microbial infections, which in turn allow the organs to restore the body’s stability through a self-regulating process known as homeostasis. When the body is stable and all systems are functioning normally, unfettered regeneration of healthy cells can occur to repair the damaged organs, and all other tissues, more efficiently. In fact, we can readily observe that there is less scarring for an open wound after the injury has healed in such a short time when the bloodstream is thoroughly cleansed of parasites with the help of this device. The same thing could happen in our internal organs. Scenario no. 2 is what we’ve learned to accept for generations. But is it really hard to achieve scenario no. 3 with adequate rest, good nutrition, regular physical exercise and regular electrification of the parasites? With this device, you can do the antiviral treatment non-invasively, or without blood extraction. 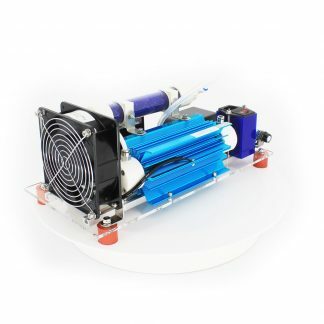 In short, the Virutron PRO Antiviral Oscillator is much better than what is described in the patent. There will never be a chance for blood contamination to happen, which is inherent in multi-user haemodialysis machines. PRECAUTION: The end-user is advised to take short treatment durations only during the first few weeks of the treatment to limit the amount of toxic neutralized parasites that needs to be flushed out from the body. More treatment tips and Suggested Treatment Schedule are outlined in the User Manual of the device. WARNING: Being the most potent anti-viral/anti-microbial protocol there is, the use of this device for antiviral treatment absolutely requires the end-user to drink generous amounts of water, at least 1 glass per 10 lbs. of body weight, daily and preferably ozonized, to help in the removal of toxins, primarily the neutralized parasites, throughout the entire duration of your eTherapy. Stop the antiviral treatment treatment immediately, and continue the intake of generous amounts of water, when signs of detoxification failure are present, e.g. headache, fever, jaundice, fatigue, or general malaise. The failure to do so may result in an irreversible kidney, spleen and liver damage. Since, most chemical intoxications can be eliminated via water dilution, too, there should be more than enough incentives why everybody needs to gradually increase their water intake now. 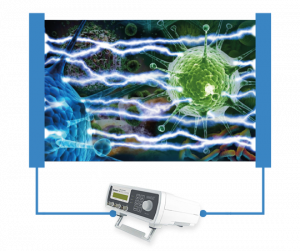 Understand that with this device, parasitic neutralization is the easiest part and you can control the amount of parasites that you want to neutralize by adjusting the length of treatment per day. But we cannot do the detoxification for you. Remember, you are now in full control of your own health. So, be responsible and always monitor your progress on a daily basis. Best of all, do enjoy healthcare freedom, just like we do for the last 10 years! Cranial Electro-Stimulation (CES) is a subject of 6 decades of independent research and patents, which continue to prove its validity as one of the safest treatments for drug addiction, depression, schizophrenia, migraine, epilepsy, aphasia, stroke, multiple sclerosis, PTSD, ADHD/ADD, etc. CES uses alternating current (AC) up to 111.11 cycles per second (Beck). This device is also capable of going beyond that frequency for possible use in bone regeneration (Becker) using an extremely low voltage. Transcranial Direct Current Stimulation (tDCS), on the other hand, is a newer concept using direct current (DC) on certain parts of the cranium. Practitioners have claimed that it increases their cognitive abilities and cured their depression. The patent application on tDCS, US20130079659 A1, is funded and developed under Contract DE-AC04-94AL85000 between Sandia Corporation and the U.S. Department of Energy. With our exclusive NeuroSweep® features, the device is capable of sweeping across two frequency endpoints for more effective and convenient CES and tDCS treatments. 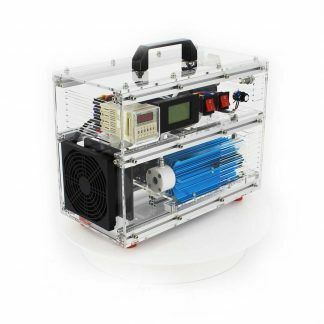 The device comes with a separate high capacity Powerbank for safer off-grid eTherapy treatment, and with high-quality accessories for long, reliable use. It also comes with an easy to follow User Manual that includes a concise Getting Started section, a quick guide of the front panel controls, and a separate, detailed discussion of our research on the subject. WARNING: For CES and tDCS applications, always start at the lowest amplitude by setting the relevant keys and knob prior to plugging the electrode pads in. Experts on the practice have determined that 2.0mA is the maximum current to have a significant effect that would last for 24 hours, at least. You will be given your own free multimeter for monitoring the actual current flow during any of the CES / tDCS treatments. All peripheral devices have their own user manuals and are easy to use. 16 CES premodulated waveforms and frequencies that are stated in various patents to be useful in attaining better resolution to substance addiction, insomnia, depression, etc. 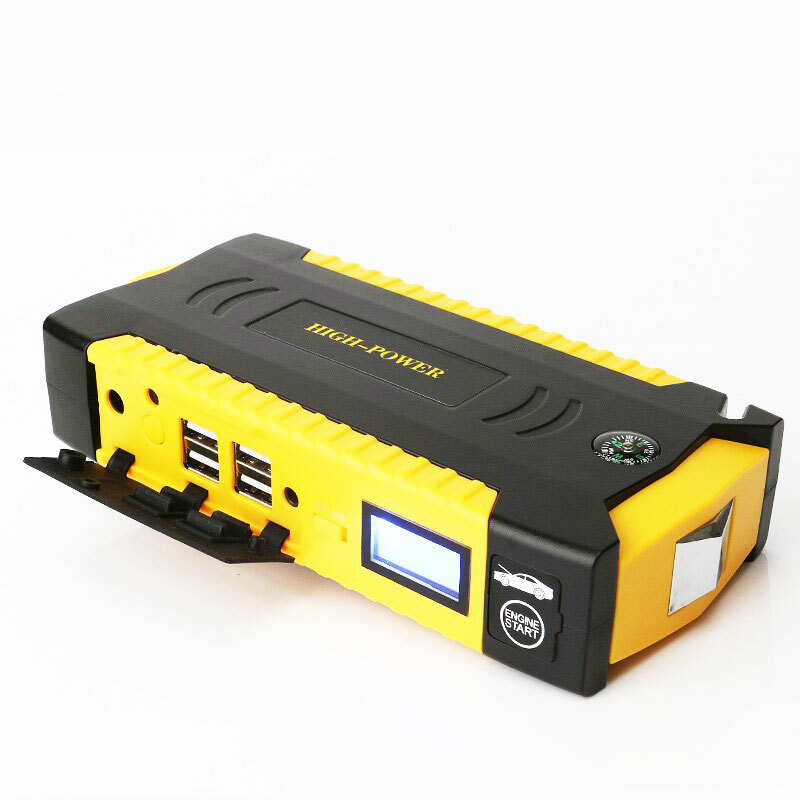 To ensure user’s safety, the unit is offered together with a high capacity and rechargeable 9v/12v/24v DC Powerbank that should be the only type of power source that is used to run the unit in every treatment session, whether CES or antiviral treatment. Standard short circuit protection is also built into the device, and the whole package is fully compliant with all known medical and electrical regulations. The same antiviral treatment protocol has already saved thousands of cancer and AIDS victims since its first release in 1990s. It is based on the same patent shown above and is thoroughly discussed in our Towards Healthcare Emancipation eBook. This simple yet very effective antiviral protocol deserves nothing less than the finest version so far. In addition to the printed Getting Started booklet accompanying this device, the purchase of this unit will also include the relevant, fully illustrated DIY instructions from that same eBook, which are incorporated into the downloadable User Manual for this device. Note: Just open a support ticket if you haven’t received your download link due to a strict spam filter. FREEBIE #1: We are giving away a high-capacity Powerbank for FREE for all customers! For US/UK-based buyers, they will receive 18000mAh External Battery Pack that enjoys good reviews in Amazon, or its equivalent. Rechargeable Powerbank for safely powering your device. FREEBIE #2: We are also giving away one (1) unit Digital Multimeter for AC/DC ampere monitoring during treatments. This unit features a 2000 count and backlighted display for easy readings across wave formats. 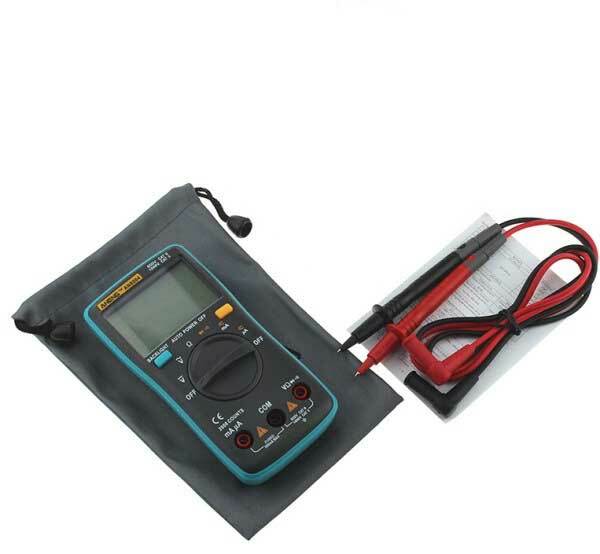 This is also very handy for checking defective treatment cables. 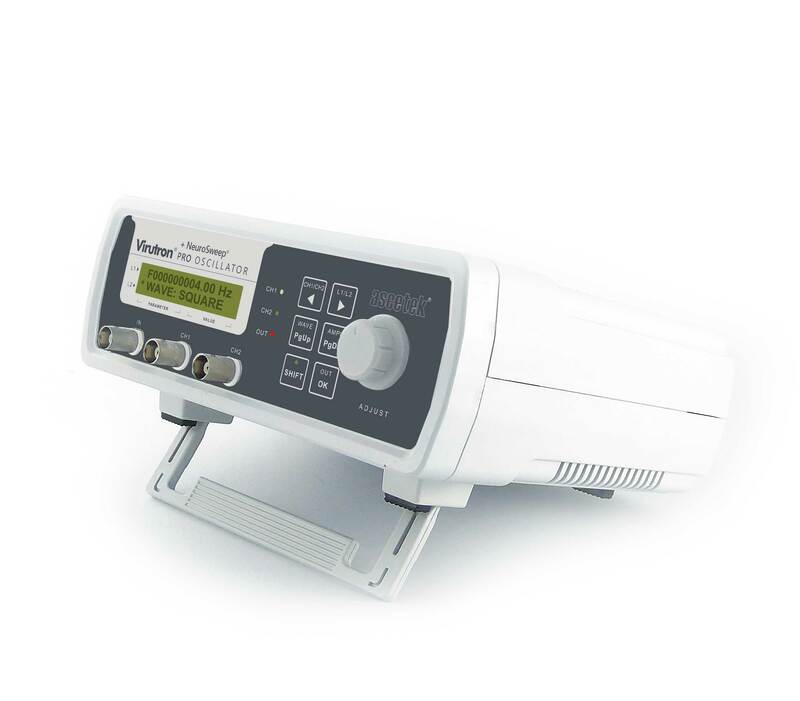 FREE Digital Multimeter for monitoring actual current flowing through the treatment site. For the specific purpose outlined here, you need not use all of the accessories that goes with the meter, as shown on the right. Instead, we will simplify and provide our own color coded cables and easy-to-follow connection diagram within the User Manual, for proper execution of the treatments in the comfort and privacy of your own home. WARNING: Please use offline 9v to 24v DC power source only during treatment to avoid power utility electrocution. The price includes free shipping to most countries worldwide. We will choose the best courier for our mutual benefit. Click here for more information on shipping and delivery. We ship within 24 hours from payment confirmation, except weekends and holidays. Incoterm: Free Carrier [FCA]. * The high-capacity Powerbank is FREE for all customers, and will be shipped separately from the main device to facilitate clearing at the Customs. Local Philippine customers will have their entire system shipped in one package. 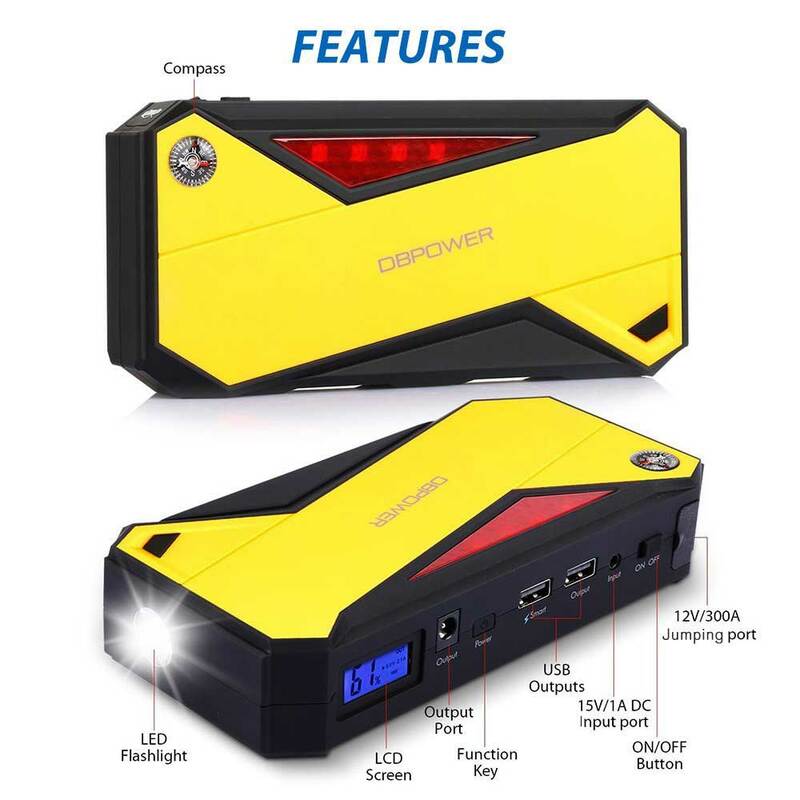 ** We continue to improve this package and if you received the latest 9v/12v/24v DC powered system, just make sure to use the OUTPUT socket of the Powerbank and not anything else. WARNING: Never use the antiviral device with an AC adaptor/charger that is still powered directly from a household outlet, or utility mains. Full 1 year for parts and labor in case the unit needs repair. The unit can also be returned within the first week from receipt thereof. This warranty does not include all freebies, wires/cables and consumables that come with the package. For a complete information of our terms and policies, please click on Refund and Return Policy, and all other relevant links at the bottom of this page. If you need support, just click on the Desk Assistant at the bottom-left portion of this page to open a ticket. The actual device may have a different color due to differences in lighting, camera and monitor settings. Likewise, the labels and description on the front panel may not be reflective of its indicated purpose and for which it is intended, due to UCC and other legal restrictions. However, all the technical specifications stipulated above remain true and correct. We are also required to not make any therapeutic claims, even when we have cured our own ailments a decade ago, and that we continue to enjoy a drugless existence ever since. … while the tDCS is still considered as an experimental modality by the medical establishment. With this device, you are in full control of its operation, from the actual frequency to the magnitude of the signal during treatments. As a direct consequence of its proper use, you are now in full control of your own health. It is therefore considered that the sale, acceptance and proper use of this device are solely of your own volition, and that its full, proper implementation is left to your own discretion, as a responsible Sovereign Human Being. If you disagree with all of the foregoing statements, please don’t buy this device. It’s not a scam when the seller provides a Full MoneyBack Guarantee during the entire period that it also claims that you can cure yourself of your ailments. It also is not a scam if it uses PayPal as the primary mode of payment because PayPal protects the buyer more than the seller whenever a problem arises. Most importantly, it’s not a scam when it’s a one-time purchase only, and not make you perpetually dependent on the seller. the prescription is given by an “expert” who is also suffering from the same, or any other, ailment. In deep contrast, we are promoting this technology from the standpoint of not being sick for the last 10 years, and we want you to experience what real healthcare freedom is all about. Governments are Corporations, too. They survive through profit and rentals [taxes] from us, the tenants. Both sides must interface with an imposed system where even the access to the most basic of necessities, e.g. food and healthcare, are all subject to competition, i.e. the survival of the fittest. This technology is real, simple enough to be implemented at home, and offers many advantages that are inherently absent from all mainstream modalities. But it is highly disruptive for the scarcity-based economic system that we are all in, as CNBC headlines the question, “Is curing patients a sustainable business model?, asked Goldman Sachs executive in a biotech report. Incidentally, among our first customers for this device are medical doctors, and they haven’t returned their units yet up to now. The only way to find out if it works for you and your family is really to try it out with Full MoneyBack Guarantee, before it is suppressed again! All known and required healing frequencies, plus a wide allowance for research. Is this product available here in the Philippines? Yes, it’s available here in the country. For faster query response, please use the Support page. You said in your article that one must consume ozonied water depending on the body weight per pound to flush out toxins. Now, my questions is, what if I dont have access to ozonied water? Lets say, I dont know where to get one, Is it okay if I comsume mineral water or purified water? Then you won’t be able to neutralize the other root cause of most diseases, which is toxic chemicals, e.g.. heavy metals. The removal of toxic neutralized parasites should still be satisfied if you consume the right proportion of water according to your body weight.